Hearing a rumour that the 25.91m motor yacht Mariah had been sold, I call her central agent, Tom Cleator of Fraser Yachts in San Diego who confirms that the transaction went through last week. 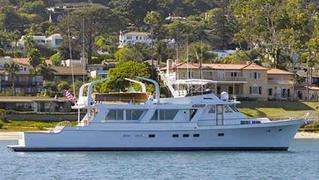 Mariah is a fibreglass semi-displacement motor yacht built by Jones Goodell in 1980. Refitted in 2007, this superyacht sleeps six guests in three cabins and cruises at 12 knots. She was on the market asking $825,000.